For your events and other occasions that would require you to be all dolled up, I suggest heading over to your favorite makeup counter and get your makeup done there instead. Most likely, they will have a promo that would give you a free makeover when you purchase something from their brand. You get your money's worth and some new products to take home as well. It's a better alternative and most of the time, more affordable than going to a salon or hiring a makeup artist to do your makeup. But don't just go to any makeup counters! Go to the ones that have highly trained makeup artists. I suggest, heading over to The Body Shop. Based on my experiences for some years now, they really do have talented makeup artists capable of creating any kind of makeup looks you require. From no makeup makeup looks to smokey ones. 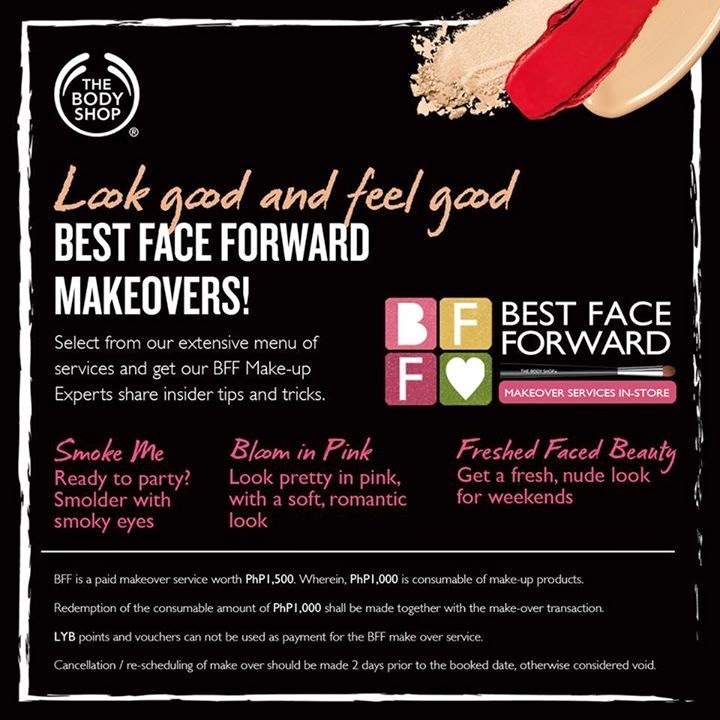 Just a few days ago, I got to try their Best Face Forward Makeover Services In-Store at The Body Shop Podium. It's a paid makeover of Php1500. One thousand (Php1000) of which is consumable for regular priced items. That means, you're only paying Php500 for the makeover. :) What a steal, right? Take a look at my makeover after the jump! This is me without makeup. Ewww. :) But really love that my skin has even out. Thanks to the Vitamin C line of The Body Shop. :) I only have the pimples at my forehead to deal with. I also switched to Colgate Confidence to reduce the peri-oral dermatitis around my chin and it's working! Annalyn applied a mix of Oil Free Foundation and the popular Moisture White Shiso BB Cream. With the Lightening Touch Concelaer (I need to repurchase another one again! ), she erased the darkness around my undereyes. Annalyn used my favorite Brow & Liner Kit in 02. She defined my eyes using Colour Crush Eyeshadow in Oh Honey and Coconuts About You. I ordered extra wings and she gave them to me using The Body Shop Liquid Eyeliner. And for a lasting lip color, she applied Rosy Red lip liner to prep my lips. I definitely feel and look made over! :) It's been awhile since I last sported red lips and I forgot how flattering it is on me! Yes, I praised myself once in awhile. But more so of Annalyn's talent. She did this look in less than 20 minutes! Having had a glimpse of The Body Shop training, it wasn't really a surprise. Their artists are very well-trained. They all come out very skilled and able to recreate any looks we want. They are are also very knowledgeable with their products and what suits our skin best. Find out more about The Body Shop, their products and their promos, visit their website here.